Written by Jacki Witlen coloradoan Couple Discovers more than expected in African journey. Couple Discovers more than expected in African journey. Before we left for Morocco, many of our friends asked if we were worried about traveling to Northern Africa now. Our immediate answer was “no” – we’ve always traveled with abandon. But it was horrific for us to learn that less than a month later the pulsating central square of the old medina Djemaa el Fna in Marrakech where we had just wandered, shopped, ate and were entertained was bombed. Our thoughts and prayers go out to those affected by the insanity of madmen. 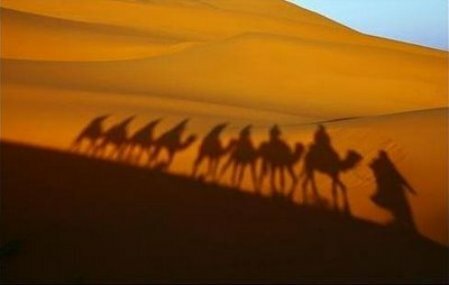 “Ali Baba and the 40 Thieves,” “Aladdin and his Magic Lamp,” camel caravans in the Sahara, riding like the wind Lawrence of Arabia style over golden sands were some visions we expected of Morocco. What we discovered was this small North African country was definitely exotic and topographically more diverse than we expected. Our travels took us north to the Rif Mountains where we first learned about the fiercely independent and self-sufficient Berbers who have survived countless generations and have preserved some of North Africa’s richest traditions. Driving through the imposing Atlas Mountains reminded us of our Rocky Mountains. As we continued traveling southeast, we were treated to another color palette for our senses – the ocher adobe cities in the Oases and the high walled fortress Kasbahs that blend with the sand-colored landscape. Fertile soil and lush rolling green hills added yet another dimension. The journey continued until we reached the vast sand seas of Erg Chebbi in the Sahara and were privileged to meet the nomadic Imazighen – men of the land, or “Free Men” – who inhabit the dessert. We experienced new cultural discoveries daily and were enthralled by the bustling medieval cities, especially Fes, with its labyrinth of 9,000 winding alleyways and were awestruck by the tranquility of the Sahara – a timeless sea of sand – that seems to stretch to infinity and from where you can almost touch the Milky Way. All our senses were on overload as we navigated winding marketplaces and walked side by side with livestock and merchants haggling prices for cows, bulls, horses, sheep, goats and camels. There is the constant background chorus – “Balek! Balek!” (Watch out! Watch out!) from donkey handlers whose charge carry enormous loads from adobe to bales of hay. The cities are a circus for ears and eyes. Morocco is undoubtedly a country that travels by four-legged creatures pulling rickety carts and wagons in their day-to-day lives. From squatty potties to hunting for the treasures of Aladdin deep in the treasure-troves of dark alleys of the souks, Jay and I feel privileged for the opportunity to visit faraway places and always return home grateful. The traditional clothing worn by men and women is interesting and unique. Women wear silky colorful hijabs and matching coats and seem to enjoy a sense of style. The men’s clothing is very special with pointed hood and large pockets made of different fabrics depending on the weather. When we inquired about the significance of the hood, we were told it was for everything from keeping the rain/sun out of faces to holding oranges and goods from the market. The Touareg Tribe, the “Blue Men” from the Sahara, wear distinctively colorful gold embroidered caftans of blue or white with intricately wound turbans on their heads. Snap. What a picture. So what would a Witlen travelogue look like if we didn’t share stories about the food, the markets and the wine? Drinking alcohol in a Muslim country isn’t an easy accomplishment. Suffice it to say that many a meal was paired with water. Yikes! However, hearty travelers that we are, we put ourselves into survival mode and managed to drink some fairly awful wine and some well-thought out Ketel One brought from home. Moroccan cooking is a blend of subtle spices, including cinnamon, tumeric, paprika and black pepper, which creates a sweet and savory effect. Olives, eggplant, root vegetables, prunes, nuts, apricots and chicken (made into tagines or cous cous are staples). We found the food substantial and enjoyable. Jay feasted on goat head, which he gave very favorable reviews. Very memorable and highly recommended is the barbecue, in which the smaller villages specialize. You pick your meat hanging from a hook and pay by the kilo from the butcher who grinds it together with a slab of fat to make into meatballs for kebabs, cooked over a coal-driven oil tank grill and fanned with cardboard to ensure the meat is well-flavored with smoke. This was interesting, tasty and eaten with the first three fingers of your right hand (for sanitation purposes). The Kasbahs. The souks. The sounds of the call to prayer in a small village the morning after a hearty rain while listening to roosters crow waking up the valley. Literally running through the alleyways in Fes after being disconnected with our group because we lagged behind for a shopping experience. A definite wow was observing the process, as old as time, of men hand-tanning and dying goat, camel and cow hides in huge vats of poppy, cumin, saffron and indigo, and the odors which accompanied this process from pigeon droppings and urine that break down the hides. Overlooking thousands of date palm trees in a valley oasis. Gray-blue skies and a rumble of clouds on the low horizon as we walked to a nomadic tent in the Atlas Mountains. Four-wheel jeep riding through vast amounts of volcanic nothingness and coming upon what we were searching for – the golden sands of the Sahara – and our dessert camp. Awe inspiring. Watching a woman draw water from a well in the middle of the Sahara is a scene straight from the “Ten Commandments.” The sight of glowing globe-shaped light bulbs illuminating 100 colorful food tents as the smoke from food stations wafts above at the nighttime food market in Marrakech, together with the sounds of hawkers, the back light of the mosque and the square’s intensely spectacular food circus atmosphere. We’d like to say “Shukran” (thank you) for allowing us to share a bit of our story with you. “Salam” (peace).